Forget about boring classes that eat up your nights and weekends. 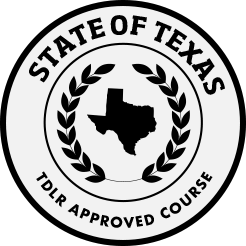 Our Texas defensive driving course (or driving safety course) is all online for your convenience. Dismiss your ticket and clear your record on your schedule, anywhere there's an Internet connection! Not only do you avoid an insurance hike, you actually get an insurance discount. Our course is approved by the court and the TEA / TDLR (course provider #CP548, school #C2548). 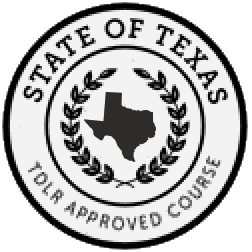 Fully approved course available no matter where you are in Texas! Ready for traffic school? Check out our Texas Defensive Driving course! Got a ticket in Texas? Sign up for defensive driving online: it's the fast and flexible way to keep your driving record clean. Our court-approved Texas defensive driving course, also known as a driving safety course, is designed to fit your schedule. Create an account now and request a time for your lesson! Clearing your record is quick and simple with us! The course is all accessible online 24/7. Just log in and out whenever you want—we'll save your place in the course. Our interactive online course teaches defensive driving techniques to keep you from getting more tickets and fines. More importantly, it'll prepare you for dealing with dangerous situations on the road and preventing costly collisions. Once you complete the course, we'll send you a Certificate of Completion, and you'll be ready to clear your ticket. Did you know that a moving violation on your driving record can increase your insurance rates by as much as 20 percent? Luckily, you can take our course to keep points off your record so your insurance rates stay low. With all the expenses you'll avoid and the savings you'll earn over the years, our course pays for itself and then some. Our Texas defensive driving course is a lifelong investment that can help you save money—and lives. Get Your Texas Driving Record! Some courts in Texas require you to submit a copy of your driving record for ticket dismissal. All done with your defensive driving course and need your record? Order it now! We'll provide your type 3A driving record, revealing your complete driving history. This type of driving record is certified by the Texas DPS and accepted by the court. You can get your record by mail or download it online (it may take up to 24 hours for you to receive the record). Save time the smart way by bundling your defensive driving course and driving record. Here you can enroll and complete your defensive driving course, then receive your DPS-certified driving record within 24 hours – all in one place. Count on the same, hassle-free service from the #1 provider of drivers education.